YOU GUYS. WE MADE IT TO THE END OF THE WEEK! Was it just me or did this feel like the longest week EVAH? Then again, I think I feel that way every.single.week. You too? Glad it’s not just me. Now, because you worked SO hard this week and got ALL THE THINGS crossed off your to-do list, I think you deserve a treat. Whaddya think? Ya’ll KNOW that I have a slight love of peanut butter (read: a total and complete undying love for the stuff. Somuchso that if it had asked me to marry it pre-Mr. FFF I would have said yes.) SO, OBVI when my brain thinks of “treats that make ya face say GOOD GOLLY YUM” it goes toward this ULTRA creamy, nutterific goodness. You guys. I just let you into my BRAIN. Was it a scary and not-super-sensical place? Probably. How-EV-ER, today we are not just talking about any old peanut butter (not that any peanut butter is inferior, I am an equal opportunity peanut butter-ist.) Today it’s SALTED CARAMEL PEANUT BUTTER. Like. WHOA. !!! + more !!!!! for the EFFECT. I have been eating SKIPPY Peanut Butter for as long as I can remember being on this earth, so when I had the chance to try the NEW, limited-edition Peanut Butter Spread with Salted Caramel Creamy, well…I didn’t even have to think for .01 seconds. YES YES YES…..please. We can’t get rude in our excitement. You understand. This peanut butter is the ultimate you guys. If you were on the brink of attending PB Anonymous before, just wait until you try this. It’s still got the rich, smooth texture that we all know and love from SKIPPY. BUT THEN an extra layers of salty/sweet goodness that will make your taste buds fall RIGHT OUT OF YOUR MOUTH. And you won’t even be worried about it. After tasting the ULTIMATE peanut butter, I knew it would make the ultimate peanut butter oatmeal cookie. BUT, that would be a little predictable right? You know we don’t do things like that ‘round here. 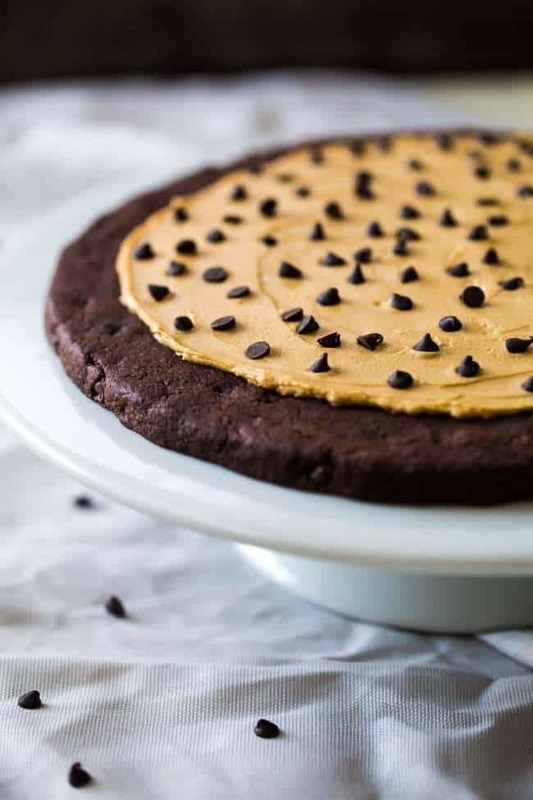 Enter the Chocolate Peanut Butter Cookie PIZZA! That justsohappens to be gluten free, INSANELY easy , ready before you can say “scrumdiddlyumptious” and protein packed due to Greek Yogurt Frosting. Yogurt. It aint just for your breakfast nums anymore. Now, before you RUN (don’t walk guys. DON’T DO IT) to the grocery store to find SKIPPY Peanut Butter Spread with Salted Caramel (because it’s on shelves now!) can I make a suggestion? You might (read: will) just need some fun finger foodies to serve at the awesome bash that I KNOW you’re throwing. And NUTHIN’ brings people together like chocolate, peanut butter, salted Caramel and pizza. 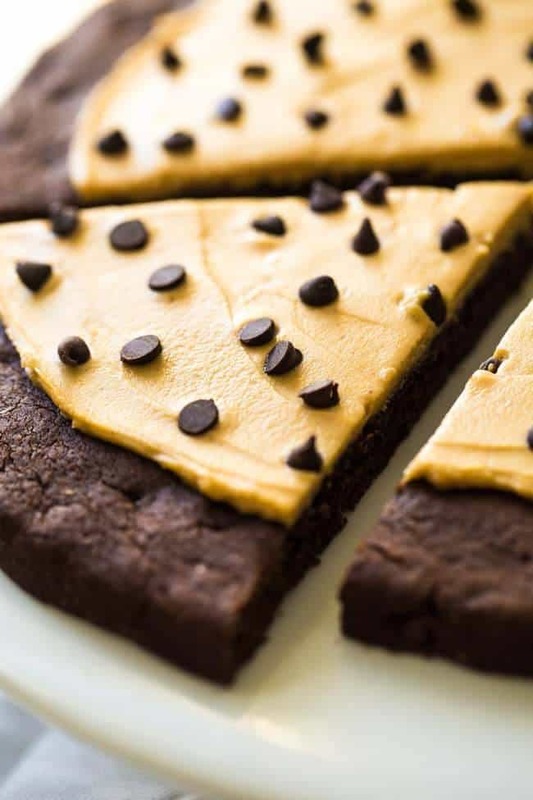 This chocolate cookie pizza is gluten free, high in protein and so quick and easy to make! Nobody will know it's a healthier treat! 1/2 Cup + 2 Tbsp Gluten free Oat flour click HERE to see how to make it yourself! 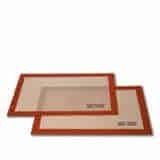 Preheat oven with 375 degrees and line a cookie sheet[/url]with parchment paper or a [url href=http://amzn.to/1L4ptfF target=_blank rel=nofollow]silpat. Set aside. 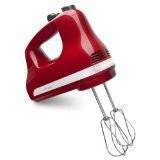 In alarge bowl[/url], beat together the peanut butter, brown sugar and white sugar on high speed using an[url href=http://amzn.to/1jFCWVo target=_blank rel=nofollow]electric hand mixer, until light and fluffy. Add in the vanilla extract and egg whites and beat until well combined. In a large bowl, stir together the oat flour, baking powder, salt, and cocoa powder until well combined. Stir the flour mixture, along with the chocolate chips into the peanut butter mixture until well combined. The dough will be quite sticky. Roll the dough into a ball and place onto the prepared cookie sheet. 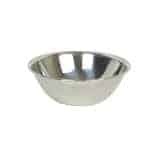 Pat into a circle that is about 9 inches in diameter. Bake until the edges just feel set, about 15 minutes. Let cool on the pan. Once cookie has cooled, mix together the frosting ingredients in a small bowl and spread on top of the cookie. Sprinkle with additional mini chocolate chips and DEVOUR. Be sure to check out SKIPPY’S BRAND NEW Tumblr Page, which will be helping launch this new vareity! This post is sponsored by SKIPPY Peanut Butter. Thank you so much for allowing me to continue creating great content for you by supporting brands that Food Faith Fitness loves to partner with! Want more Chocolate and Peanut Butter Goodness? It has been a long week and I totally agree that this is a perfect way to celebrate its end. and I’m so loving that greek yogurt frosting! So glad you approve girlfriend! Thanks Tori! 😀 Happy Friday! Hooray for Friday! This was definitely a long week! And what better way to celebrate than with this cookie pizza. This is all kinds of amazing, Taylor! I love the salted caramel peanut butter frosting. Amazing! And pinned! Thank you so much for lovin’ and pinnin’ Gayle! I hope you have a great weekend and Valentines! EXACTLT 😉 I knew I liked you 😉 Thank you Matea!! Whhhattt??!! There is a salted caramel peanut butter? Just added more one errand to that ever growing too do list. But atlas at the end there will be this cookie pizza. Too die for, Taylor! This would hit the spot anytime of the day for me. Head over heels for chocolate and peanut butter! You and me both..love it! Thank you! 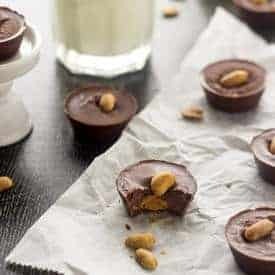 A “skinny” chocolate and peanut butter recipe?? Sign me up!! 🙂 This looks fabulous! I know right? Can’t go wrong! Thanks heaps Renee! Happy weekend! Love the salty sweet combo of this!! We are a huge Skippy family! SKIPPY is the best! Thank you Liz! You are my healthy dessert hero. This looks amazing! Pinned! I aim to please 😉 Thanks Julie! What? Salted Caramel? Um… yes yes yes please!!! I did make it to the end of the week and I SOOOO deserve this recipe especially if I’m cooking valentines day dinner tomorrow. Happening in dis kitchen asap! UM YES you do deserve it! And you gotta find the PB girl..amazing! Thanks! You can never go wrong with peanut butter and chocolate because they are the perfect combo. I’m sure this pizza tasted as delicious as it looks! This is so fun!!! I have yet to make frosting with greek yogurt, but I can’t wait to try it. You gotta try it girl, it’s bomb! Thanks! Why thank you for that chocolate and peanut butter goodness girl! Looks perfect. And just what a girl needs after an exhausting week! It has been a long week right?! Thank you! I hope you get spoiled! Oooo cookie pizza! Pizza…savory or sweet…you can never go wrong with the round pie! Right! Always the best! Thank you! I had NO idea Skippy made a salted caramel PB. Sounds delish! It’s BRAND NEW! SO GREAT! Thanks Rebecca! What an amazing gluten free treat! That peanut butter sounds totally insane! It is…in the best possibile insanity! Thank you! This treat looks so, so perfect Taylor! And how can you go wrong w/ chocolate and pb? You really just can’t haha! Thank you! Wow! 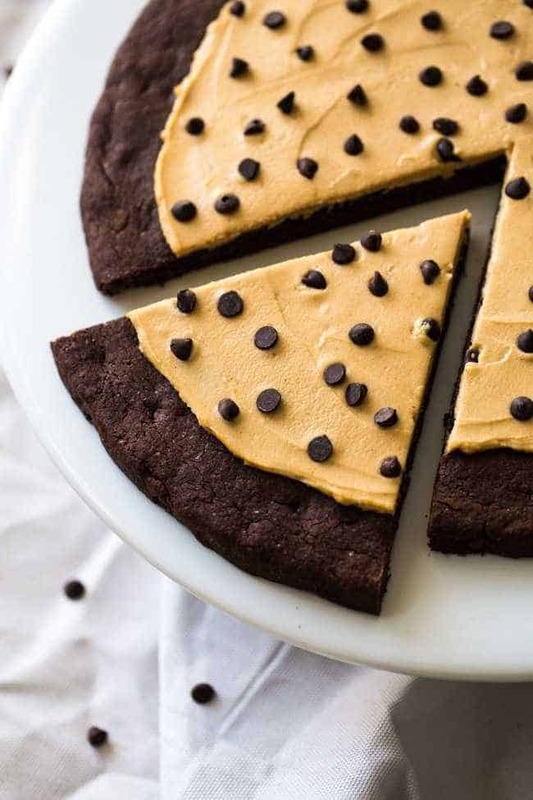 That looks like some great peanut butter and it is perfect on the cookie pizza! It’s supa yum! Thank you Tonia! You’re right. I DO deserve a treat! 🙂 We always had Skippy peanut butter too, and it was the ONLY kind I’d buy until I started making my own!! 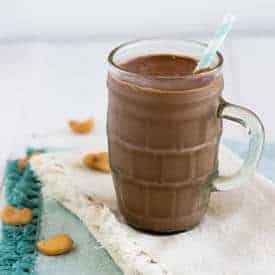 I have yet to make my own because SKIPPY is just so good! Thank you Alysia! That frosting is to die for! Love this little dessert pizza Taylor! Oh my gosh, I didn’t know there was a Skippy salted caramel peanut butter?! I have to get me some ASAP. 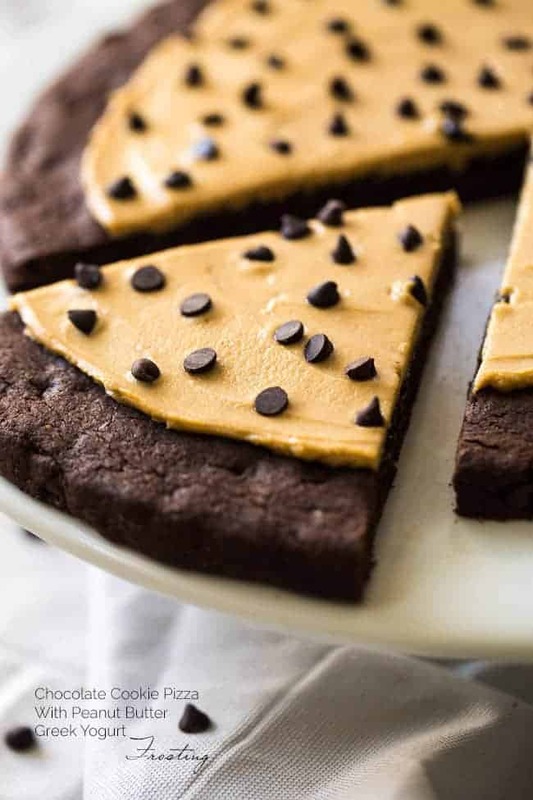 I love peanut butter anything and this cookie pizza looks amazing! It’s new! You gotta find it!! Thank you Danielle! This looks heavenly T! I hope you saved me a slice? Or perhaps you can make this for me when you move closer… although I do realize that the mover tends to receive the food gifts, not give the food gifts, but whatever, we’ll bend the rules in this case. I can’t confirm or deny that I ate it ALL…sorry 😉 Thanks Melanie! Absolutely can’t wait to give this a try! Long live the happy marriage of peanut butter and chocolate! Now this is my kind of pizza!!!! Yum! I’m going to have to go get me some Salted Caramel Peanut Butter too…just to eat with a spoon most likely. Yep..Spoon is defs a good idea 😉 Thanks Serene! Let me first say you are the QUEEN of peanut butter goodness! 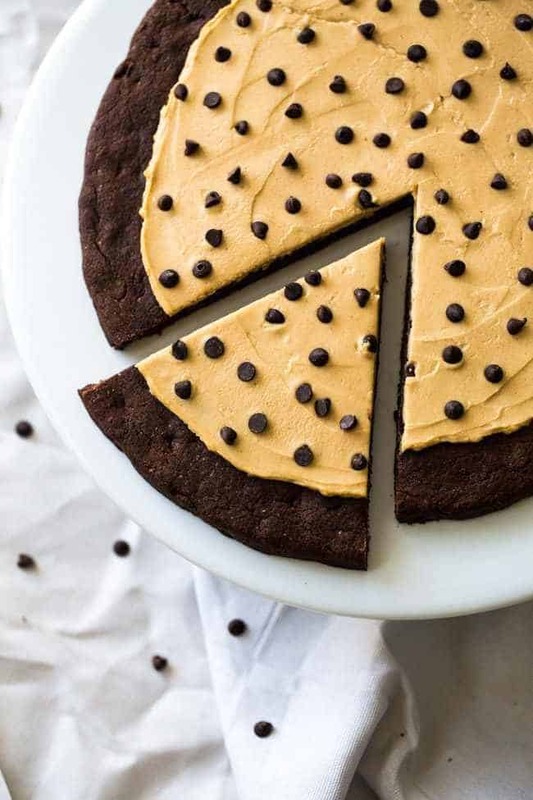 This cookie pizza looks and sounds delicious to the max and love how you make it healthy too! Pinned. Haha thank you so much Laura! It’s definitely been a long week and I’m dying for this cookie pizza to make me feel better! Caramel peanut butter? Oh.em.gee! I definitely need that pronto! Pinned! You DO need that Lindsay! Thank you! This pizza is SO much fun! I would love to take a giant spoonful of that peanut butter! Nothing beats a delicious chocolate peanut butter treat…especially made with a healthy twist! I have to get my hands on a jar of that salted caramel pb…it sounds fabulous! You will love it Alida, thank you! SWOOOOON! This is my kind of treat! YUM!! This may be a really dumb question, but what is the difference between steel-cut, regular and rolled oats? 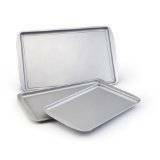 Steel cut – is not cut at all so the cook VERY slow (great for things like slow cooker oatmeal!) Did that help at all? 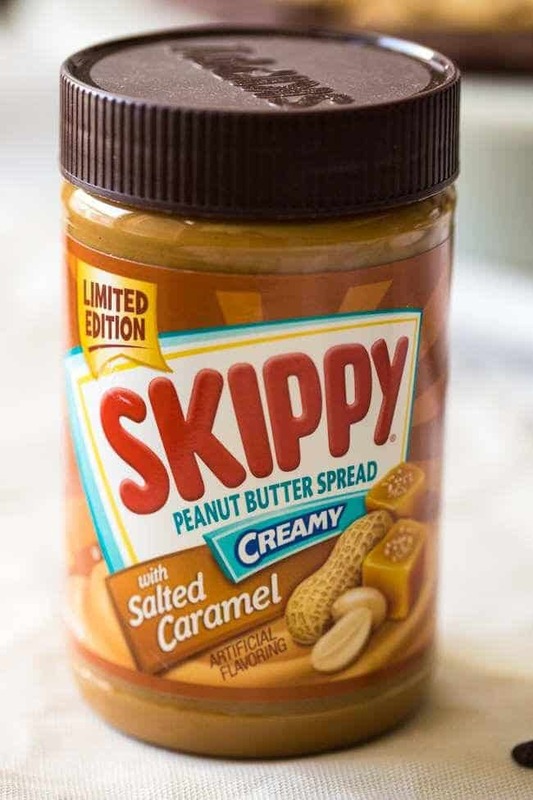 Ok so I LOVE PB and I LOVE salted caramel but did Skippy really just make them have a love baby? GENIUS! Then you went and threw in some chocolate and my head exploded! DELICIOUS! HAHA! They DID have a love baby!! That is one great looking pizza! Taylor, I have been thinking about this pizza all day….since I first saw it this morning. It sounds SO amazing!!!! 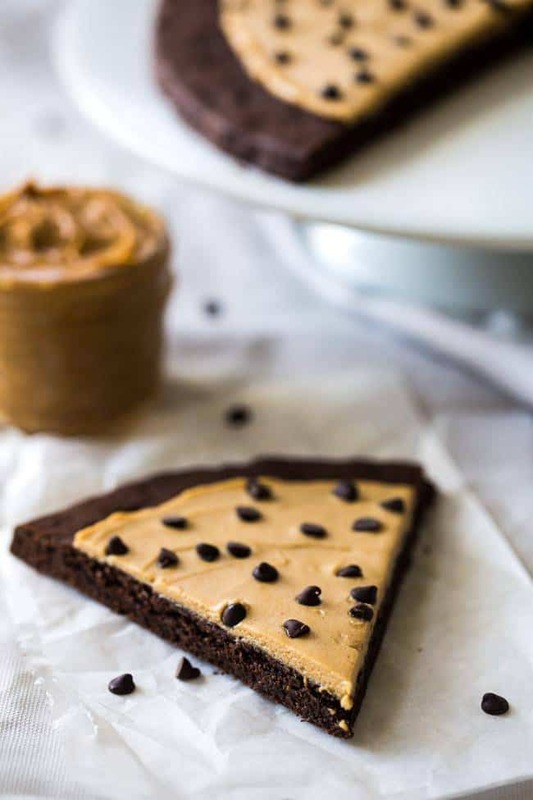 I have already pinned, and I would not be surprised if I end up making it tonight while waiting for my man to come home, does it get any better than cookies, chocolate, peanut butter and pizza!? I think not! Wow this looks AMAZING! I can’t wait to try it! This looks so amazing… salted anything is my favorite so I can’t wait to give this a try! Mine too! Salty and sweet is the best. Thanks Holly! Oh yes, I have a deep love for peanut butter too! I HAVE to get that salted caramel peanut butter! This looks crazy good! You really do – it’s so great! Thanks Tanya! 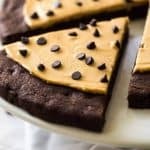 I love eating Skippy Peanut Butter by the spoonful and making this chocolate cookie pizza sounds like an even better idea! I’ll take a slice, please! You and me both girl! Thanks so much! LOVE LOVE LOVE me some peanut butter. I also love giant cookies and recipes that use Greek yogurt so I don’t feel guilty about eating it at breakfast. EXACTLY my thoughts re: Greek yogurt and breakfast! Ha! Thank you! WHAT a week it’s been! Taylor you’re always so creative with your recipes! I love the concept behind this delicious looking cookie pizza and I love Skippy! Thank you so much Jessica! We’re all about the Skippy! Legit hated you inside whenyou posted a picture of that peanut butter on instagram. We have such an amazing range here in Australia. Normal, reduced fat and salt free. PArty party. This would be the perfect dessert AFTER pizza. Haha that does sound like quite the pb party. OH. MY. GOSH. you just went there didn’t you. I’m one of those few weirdo’s who does NOT like peanut butter. I’m not allergic or anything, I just don’t like the taste. Which is a shame, because so many delicious recipes (like this one!) have PB in them! That said, my family and my kids ADORE peanut butter, and I think they would LOVE this! Going to pin it for later, thank you! DON’T LIKE PEANUT BUTTER?! AHH! But, I am glad you have someone to make it for 😉 Thanks for the pin! Yep, making you it right now! Thanks lady! It’s been such a long week and this cookie pizza sounds like the best way to celebrate! It looks incredible! Salted caramel peanut butter? Oh my gosh, I have to look for that! RIGHT! You really do gotta find it, it’s the bomb! Thanks Kelly! As soon as I saw they announced their new flavor on Twitter, I went to the store but couldn’t find it (yet). How rude of my grocery stores! Soon it will be mine and soon I will make this cookie pizza 😀 I have so many peanut butter recipes it’s ridiculous. HAHA! SO RUDE! But I promise it will be worth the wait. 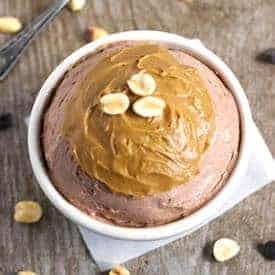 I have so many PB recipes too, I can’t go a day without! Thanks Carla! Why does the week always feel long? I’m waiting for a week that doesn’t … and then I realized, that’s why Reeses were invented. There is no such thing as a short week. I LOVE that you made a skinny version of that iconic and addictive chocolate + pb combo! This cookie pizza is gorgeous and I feel a faceplant coming on! HAHA at “that is why Reeses were invented” preach sistah!! It really has been suchhh a long week I need a slice of this deliciousness asap! This is the first time I’m hearing of this salted caramel pb and I neeeeddddd it in my life like RIGHT NOW. Getting it tomorrow! You do need it RIGHT NOW! So good! Thanks Jessica! You know I was going to say my to-do list is far from done but I’m glad you are making an exception but I don’t think there is anyway I could possible resist this cake. Cookie pizza with peanut butter caramel? yes please! juuuuust DEAD. This looks so bomb girrrl, need it! Love the chocolate and peanut butter combo! It doesn’t get any better. Thanks for linking up with What’s Cookin’ Wednesday! I agree! Thanks for hosting!